Shailendra “Shay” Kulkarni is a shareholder at Sullivan Hill and member of the Construction, Insurance, and Litigation practice groups. He focuses his practice primarily in the areas of construction and real estate litigation, insurance coverage litigation and analysis, and complex civil litigation. He also practices in the areas of surety litigation and construction-industry contracts. Mr. Kulkarni has an AV® Preeminent™ Peer Review Rating by Martindale-Hubbell. He was named a Rising Star by Super Lawyers in the areas of Construction Litigation, Business Litigation, Real Estate, and Surety Law for 2015-2019. 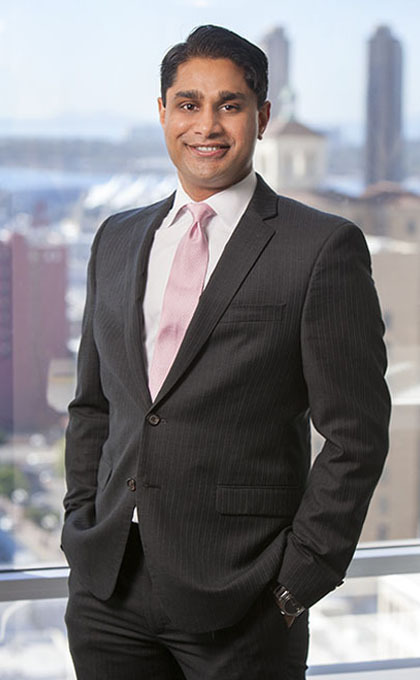 Mr. Kulkarni is listed as a 2019 Top Lawyer by San Diego Magazine. He was also named a 2018 finalist for San Diego Next Top Business Leaders Under 40 by the San Diego Business Journal. Mr. Kulkarni is currently serving as a member at large of the Construction Law Section of the San Diego County Bar Association, after having served as chairman for the previous two terms. He was recently appointed the Division 13 (Government Construction) liaison to the Diversity Committee of the ABA Forum on Construction Law. He serves as an advisory board member and Mentoring Program co-chair of the Crawford Academy of Law Program here in San Diego. He is an associate member for the San Diego/Tijuana Chapter of the Urban Land Institute. Mr. Kulkarni is also a member of various other professional and bar organizations, including the State Bar of California, the Louisiana State Bar Association, the Pearlman Association, and the National Bond Claims Association. Prior to joining Sullivan Hill, Mr. Kulkarni practiced in the areas of construction, surety, and real estate litigation in New Orleans, Louisiana. Mr. Kulkarni has extensive experience in complex construction and real estate litigation. He has tried cases before civil courts and arbitration panels and has participated in numerous mediations. He has filed appellate briefs with the Louisiana First, Third, and Fourth Circuit Courts of Appeal and the United States Fifth Circuit Court of Appeals. He is also a frequent speaker on topics in the fields of construction, surety, and real estate law. Prior to entering private practice, Mr. Kulkarni served as a law clerk for the Honorable John Saunders, Louisiana Third Circuit Court of Appeal. Assisted in successful prosecution of bid protest (and defense of subsequent counter-protest by aggrieved challenger) on behalf of joint venture concerning construction manager at risk (“CMAR”) bid process for the major planned construction of an international airport terminal, resulting in a contract award for the $546 million project. Successfully defended public owner against bid protest action challenging public entity’s disqualification of aggrieved bidder on design-build project due to bidder’s non-compliance with bid specifications concerning anticipated participation of disadvantaged business entities (“DBE”). The contract value of the project was in excess of $50 million. Prosecuted lawsuit on behalf of bidding subcontractor involving unfair trade practices and fraud allegations concerning the bidding procedures for subcontracts on federal CMAR project, resulting in favorable settlement. Represented contractor in litigation involving unfair trade practices, fraud, and single-business-entity claims involving alleged inflation of subcontract bids on federal construction project, resulting in favorable settlement. Successfully represented public owner in litigation with insurance company concerning existence and extent of insurance coverage for hurricane damage. The matter resulted in a settlement of approximately $1 million. Successfully argued appeal before the Louisiana Third Circuit Court of Appeal regarding the vesting of indemnity rights in light of the state’s statute of limitations governing the construction of buildings and improvements on real property. “Taming the Beast: Avoiding Pitfalls in E-Discovery; A Dos and Don’ts Guide,” Co-Authored with Brianna Kostecka, Esq., ABA Forum on Construction Law, December 2017. “Default is not in our Stars: California Court Comes to Bury (not Praise) the Requirement of Declaring Default under Subcontractor Performance Bond,” Division 7 Newsletter, ABA Forum on Construction Law, April 2016. “How to be Smarter than your Phone: Discovery of Emails and Text Messages in Mobile Phone Era,” Under Construction Newsletter, ABA Forum on Construction Law, December 2015. “So What’s the Remedy? Modern Trends in Miller Act Waiver Jurisprudence,” Co-Authored with Tamara Lindsay, Esq., Division 13 Newsletter, ABA Forum on Construction Law, October 2014. “Construction Law Update,” Co-presenter with Benjamin J. Morris, San Diego County Bar Association, June 2018. “Construction Litigation 101 – Understanding the Litigation Process in Construction Cases,” Co-presenter with Mike Zarconi, AGC San Diego, May 2018. “Public Bid Law 101,” Presenter, AGC San Diego, February 2018. “Understanding Construction Drawings,” Co-presenter with Paul Versage, Vista Unified School District, January 2018. “Women in Construction: Insights and Experiences of Female General Counsel,” Moderator, San Diego County Bar Association, October 2017. “Construction Contracts 101 – Common Risk-Shifting Provisions in Construction Contracts and Subcontracts,” Presenter, Associated General Contractors of America, San Diego Chapter, September 2017. “Scheduling Impact Claims: Common Legal Issues and Practical Considerations for Asserting, Proving, and/or Defending Delay, Disruption, and Acceleration Claims,” Co-presenter with Richard Tasker, Associated General Contractors of America, San Diego Chapter, August 2017. “Dispute Resolution Agreements: Functional and Dysfunctional,” Moderator/Presenter, San Diego County Bar Association, April 2017. “California Performance Bond Claims in the Wake of JMR Construction Corp. v. Environmental Assessment & Remediation Management, Inc., 243 Cal. App. 4th 571 (2015),” Co-presenter with John Yi, Esq., Surety Association of San Diego, November 2016. “A Look Inside the Surety Claims Process,” Moderator/Presenter, San Diego County Bar Association, June 2016. “Conducting Discovery in Construction Litigation,” Co-presenter with Roger Nelson, P.E., San Diego County Bar Association, March 2016. “Dos and DON’Ts of Construction Project Record Keeping,” Moderator/Presenter, Lorman Educational Services, January 2015. Contingent Payment Provisions in Louisiana, Pile Driving Contractors Association, 2014. Pay-if-Paid Clauses in Louisiana, Construction Financial Management Association, 2013. Principles of Zoning, Lorman Educational Services, 2012. Mr. Kulkarni is a member of the State Bar of California, the Louisiana State Bar Association, the San Diego County Bar Association, and the ABA Forum on Construction Law. He is an advisory board member and Mentoring Program co-chair of the Crawford Academy of Law Program. He is also an associate member for the San Diego/Tijuana Chapter of the Urban Land Institute. Mr. Kulkarni is a member of several surety-industry organizations, including the Pearlman Institute and the National Bond Claims Association.